Jeff's fascination with Chicago started when he was a kid. Growing up in Moline, Illinois his first few times visiting Chicago were for Chicago Bulls games with his dad at the old Chicago Stadium. "I really only remember bad traffic getting to the game and the Sears Tower in the distance." Since those Bulls games Jeff has always known he'd live in Chicago. 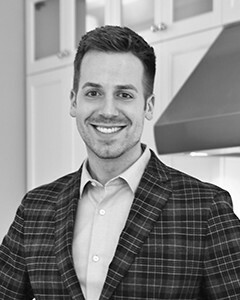 After graduating from Northern Illinois University Jeff made his move to Chicago's East Lakeview neighborhood and soon after began his real estate career joining prominent real estate developer Belgravia Group in 2008 in new construction sales. In 2009 Jeff decided to align his business with @properties. "I decided to align my business with @properties because, much like myself, they were the relative "new kid" in the real estate industry. In only nine years @properties had surpassed every established brand as the top brokerage in sales volume. Plus, the marketing wasn't stale and they pushed the envelope and continue to do that now!" Buying a home or investment property and selling a property is a pretty major life decision with real money involved and Jeff prides himself at guiding and educating his clients. "I honestly feel the processes I've established translates into a much more educated client which ultimately means a more streamlined process and less stressed out client!" Thanks to these detailed processes the majority of Jeff's business comes from referrals from clients and repeat clients ready for a new home. As a seasoned real estate investor Jeff has also purchased, renovated and flipped eight properties with two more in the works. Because of this Jeff can confidently guide clients on meaningful renovations and staging techniques that will translate into a higher home value and a home that will appeal to a broader range of people. "When I'm not working I love to travel. In the last few years I've strategically found time to travel to Turkey, France, Italy, Greece, Egypt, Kenya, Tanzania, Vietnam, Cambodia, Thailand, Indonesia, Singapore and Laos with more in the future. Other than traveling I'm all about the Chicago food scene and experiencing restaurants, breweries and festivals in the summer!" You can reach Jeff by calling 309-269-3499 or emailing JeffStewart@atproperties.com. "Jeff was professional from start to finish. The deal took a long time to close due to issues on Seller's end. However, Jeff was always reachable and responsive the entire time. The transaction was a success at the en. I would highly recommend Jeff Stewart."